Fish Selection in Gravy is rated 1.0 out of 5 by 2. Rated 1 out of 5 by Keys from Lack of Quality I bought this about a month ago, & unfortunately i think it will stay there. Complete waste of money in my opinion, & I think my cats agree judging how much they waste, & I have to throw away? I have attached a photo of said cats eating a n other popular cat food , which they would normally leave, over the Sheba.. not worth the money it's printed on in my opinion. 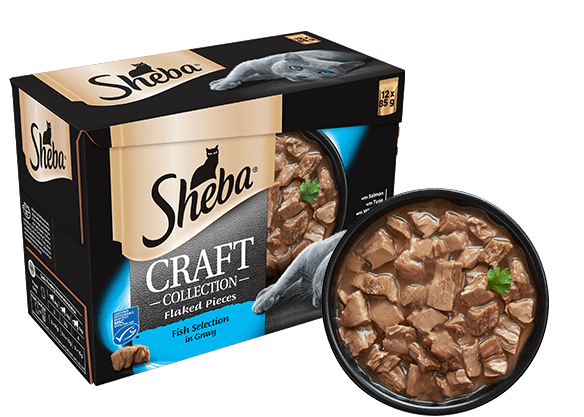 Rated 1 out of 5 by Tittle mouse from Do I really have to eat THAT Bought two packs of the new "Craft Collection" this and another to try. Unfortunately, all he does is to sniff it from a distance and maybe a lick, but that's it. Waste of money, will donate the other pack to the cat's rescue.